It ain't Survivor unless you're lying. Permalink: It ain't Survivor unless you're lying. All of us are roosters and we don't want any other roosters around. Troy and I have spent the last week as the head of the two snakes. Is my presence destroying the strategy talk? Permalink: Is my presence destroying the strategy talk? I just think you backed the wrong horse. Permalink: I just think you backed the wrong horse. I've spent eight days out here creating some power and I want to use it. I think I just aged three years. Permalink: I think I just aged three years. 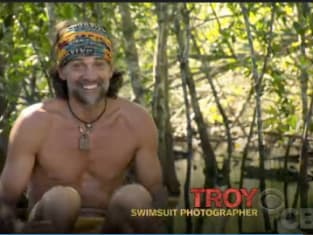 Troyzan: Well, maybe that's the thing. We're men, they're women, maybe we think different. Colton: No, that can't be it because not even I understand. The girls are beyond a mess. They're like zombies. Permalink: The girls are beyond a mess. They're like zombies.